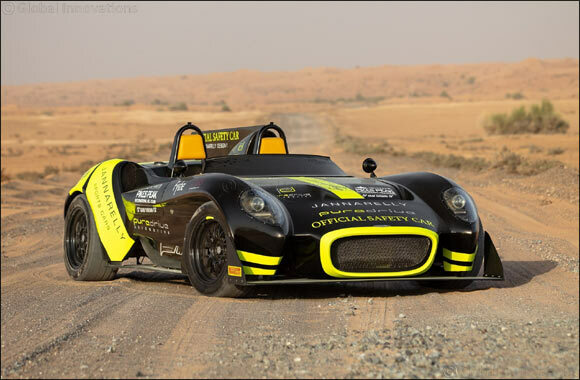 Dubai, UAE, June 7, 2018: On June 24, 2008, the UAE’s first-ever car manufacturer, Jannarelly, will become the first emirates-based enterprise to take part in the USA’s second oldest motorsport event, Pikes Peak International Hill Climb (PPIHC) in Colorado, which this year celebrates its 102nd anniversary. In a truly home-grown endeavour, a specially developed version of Jannarelly’s Design-1 sportscar will feature as the honoured ‘Official Safety Car’ (OSC); designed, developed and operated by a team co-created with fellow Dubai-based automotive pioneer, PureDrive Automotive, and supported by Pirelli. Speaking on the joint-venture, Jannarelly Co-Founder, Anthony Jannarelly, said: 'Providing the OSC through our partnership with PureDrive is a fantastic introduction to the racing world. Pikes Peak is all about twisty roads and pure thrill, so this is the perfect playground to enjoy the driving experience of our retro-futuristic Design-1. Our goal is to establish a long relationship with PureDrive and PPIHC, learn this year, and start competing in 2019'. At its heart, the Design-1 has much in common with PPIHC; wrapped within the 1960s- inspired body is a raw and emotive spirit, honed by people of passion, to immerse its subjects in truly unique experience. Packing 310BHP and weighing only 810KG in standard guise, the car offers supercar-style performance whilst the absence of inhibiting electronic aides allows the driver to retain a level of connection missing from the modern driving experience. Jannarelly’s design philosophy enables the car to be mechanically & aesthetically tailored to the exacting requirements of each individual client. History and automotive design excellence are reflected in Jannarelly’s partnership with Pirelli for the Pikes Peak International Hill Climb challenge. The history-making car, will leverage more than 140 years of tyre design excellence and will be fitted with the Italian manufacturer’s iconic P-Zero tyres. Anthony Jannarelly added: “Our partnership with Pirelli since day one has assisted us in developing the Design-1’s handling characteristics. The Design-1 was created for the driving enthusiast and the P-Zero tyre range makes for an excellent partnership for the vehicle'. Carlos Milani, MD of Middle East and Indian subcontinent, Pirelli, added: “Pirelli has more 140 years’ history of pioneering tyre design for the automotive industry and continues to the lead the way in all forms of motorsports. This is a milestone for the automotive industry in the Middle East and it aligns perfectly with Pirelli’s objectives in this region. We look forward to a long, strong relationaship with Jannarelly and PureDrive Automotive. Theo Measures: “We’re excited to be working alongside Pirelli on this project, which is just the start of our plans with the tyre manufacturer throughout 2018. Pirelli has a long history of being as leaders in motorsport, and for Pikes Peak one of the most demanding races on the planet, our first choice was Pirelli. From the outset, Anthony Jannarelly was adamant that the Design-1’s exclusivity should only be reflected in it’s strictly limited production numbers, not the price. The result means driving enthusiasts can pick up an exclusive Design-1 for AED220,500 in base spec! Currently, it is still possible to reserve one of the 30 ‘Launch Edition’ vehicles; fans of PPIHC may be more interested however in the ‘Pikes Peak Edition’, limited to just 10 models for 2018 and co-developed by PureDrive Automotive.